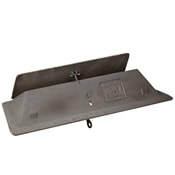 A fireplace damper is generally located just above the firebox and below the flue. A fireplace damper closes the throat or flue of the fireplace to help prevent a cold draft - air from entering your home. 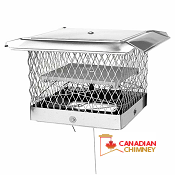 The damper also serves as means of closing off the chimney in the event of a chimney fire. Types of dampers vary depending on the fireplace type - masonry or factory-built, manufacturer and model. A masonry fireplace damper has it's purpose, but the design and the way a masonry fireplace functions often creates a draft - cold air entering your home. Installing a top sealing damper will seal the flue at the top, limiting the cold draft that would otherwise enter. ​1) The throat of every fireplace shall be equipped with a metal damper sufficiently large to cover the full area of the throat opening. A top sealing fireplace damper with a rain cap will seal the flue at the top of the chimney, and will help prevent cold air from entering your home when your fireplace is not in use - energy efficient. These top sealing dampers are also a chimney rain cap, and serve to protect the interior flue and flue liner from rain and water damages.